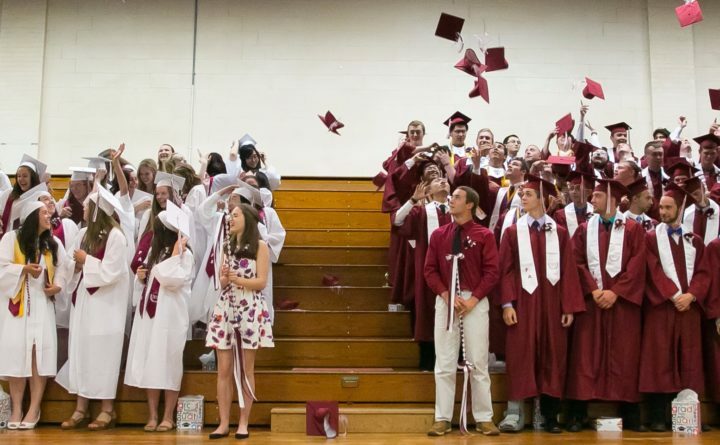 A decision on graduation gown colors for this year’s Foxcroft Academy seniors is forthcoming as members of the class of 2019 will have the opportunity to weigh in on possible options. In past years, such as in 2016, female graduates have worn white robes and male students wore burgundy. DOVER-FOXCROFT — A plan to discontinue the use of white graduation gowns for female seniors at Foxcroft Academy has sparked a debate among students, alumni and others in the community between those who favor the traditional boys-in-burgundy, girls-in-white garb reflecting school colors and those who think the change eliminates gender bias. After some Foxcroft Academy seniors objected to the plan calling for all seniors to wear burgundy gowns, the head of school said that members of the class of 2019 will have input before a final decision is made. Graduation is scheduled for Sunday, June 9, and a decision on the attire could be made next month. A specific timeline and method for reaching a decision are to be determined. Following the presentation on Monday when they first learned of the change, many seniors wanted to have a say in the gown decision. Senior Jacob Marsh set up an online petition, which drew more than 1,400 supporters. The petition helped prompt a meeting between students and the administration. “The issue is we have to operate within our guiding principles and within our mission and vision, so it’s really up to the administration and the trustees, however, I sat down and listened to them,” Shorey said of his meeting with the class of 2019 on Tuesday. Foxcroft Academy, which has always been co-ed, is an independent high school founded in 1823 and today serves as the secondary school for students from the RSU 68 communities of Charleston, Dover-Foxcroft, Monson and Sebec as well as tuition-paying boarding students with many of these pupils from abroad. Marsh said most of the concerns he received from fellow students and alumni were along the lines of tradition and representation. “Some people were worried about what would be next, if the school changed this, what other changes would be made with input from only one group,” Marsh said. “I also had many others contacting me wanting to know why this happened. I had texts, calls and comments from many past alumni who felt that this change was not what was best for the Foxcroft Academy community. I also had multiple messages from past female alumni who wanted to donate their white gowns if the school was not going to allow the students to order them. Shorey praised the way students have approached the issue. How the class of 2019 will be involved in the decision-making process is still to be determined, possibilities include a formal vote by the students on graduation gown colors and/or additional meetings to provide administrators with more feedback for them to make a decision. “It might be a student has a choice in what gown they wear, that is one option, or we go all burgundy,” Shorey said. Members of the class of 2019 have already purchased their white or burgundy gowns, and the $37 cost includes the mortar board and sash, but refunds will be provided if desired. Shorey said a gown decision could be made in mid-March. “We have all agreed to receive some training about this topic, and then from that I am going to allow some input and then we will decide,” he said. “But what that means for the future after that, I’m not sure,” he said. “I’m not sure what the final decision will be, but either way I know one thing, they will be lined up alphabetically instead of by color of robes and then as far as the gown color, we will work that out with the class. The seniors and I have some work to do.